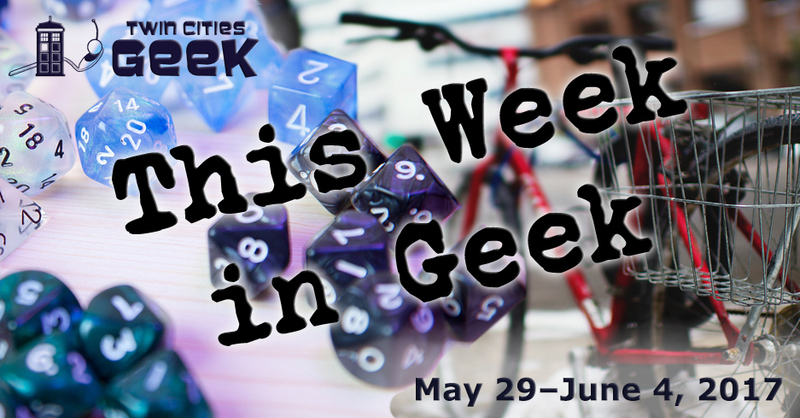 Welcome to This Week in Geek, your guide to events of interest to the Minnesota geek community for the week of Monday, May 29th through Sunday, June 4th. When: Monday, May 29th at 10:00 a.m.
Take Memorial Day as an opportunity to connect with Minnesota history through the military lens of Fort Snelling. Hang out with costumed interpreters and learn the many stories behind this historic fort, including those of Dred and Harriet Scott. Enjoy talks, a scavenger hunt, and a “living timeline” featuring costumed interpreters representing the different eras of US military history. Tickets start at $12, with a variety of discounts available. See the website for the day’s schedule. When: Monday, May 29th at 10:00 p.m.
Help say goodbye to a Twin Cities dance mainstay with the final night of Hard Mondays at the Saloon. Celebrate with DJs from this storied dance night’s two-decade run, including Panic, the Aether Twins, and Noise. This will be a great night of dark, industrial, and dance music. When: Tuesday, May 30th at 6:00 p.m. When: Tuesday, May 30th at 7:00 p.m.
Come and experience YogaQuest, a blend of yoga and fan-fiction storytelling led by certified yoga instructors. Experience a yoga workout experience and a story at the same time. This week’s special theme is Wonder Woman, so get ready to celebrate the new film and feel wonderful (and powerful). When: Wednesday, May 31st at 6:30 p.m. This class focuses on using a circular wire method to construct your own Tree of Life pendant. Additionally, you will be learning the symbolism behind the Tree of Life, an ancient symbol that arose in many world cultures. The class will be taught by the artist Jeanette Dickinson. Cost for the class is $64 for nonmembers and $52 for ArtStart members, which covers all materials. When: Thursday, June 1st at 7:00 p.m. This free event lasts from 7:00 p.m. to 9:30 p.m., and includes a mini planetarium program and a variety of activities for all ages. The theme is the upcoming solar eclipse, and many activities will focus on how to safely view it. As always, this Star Party is free. When: Thursday, June 1st at 5:00 p.m. This is a great opportunity to get to know your community, make some art, and have some questions answered. Work on mosaic making with the great artists of GoodSpace Murals, and have immigration law and produce questions answered by Hart Law Office and North County Food Alliance. When: Thursday, June 1st at 6:30 p.m. When: Friday, June 2nd at 7:00 a.m.
Come to this unique event at the Minnesota History Center for your chance to combine a love of donuts and history. The History Center will open early, at 7:00 a.m. on Friday, June 2nd for tales from humorist Kevin Kling, free donuts, and stories of heroes bringing warm donuts to troops on the front lines in France during World War I. This event is $12 for adults, with discounts for seniors, vets, students, and MNHS members. When: Friday, June 2nd at 11:00 a.m. The seed of creativity can come in many forms, but for many the first step is combination leading to novel forms and ideas. Come to this free drop-in art workshop to get creative juices flowing by working on the creation of a Chimera, a creature of multiple origins, led by a seasoned designer of video-game characters and artisanal minigolf holes and create something new. When: Friday, June 2nd at 4:00 p.m. Tap the week’s troubles away with a happy hour tap-dancing lesson at Can Can Wonderland. Get a little loose and learn a new skill while having fun. This is a free event and some tap shoes are provided. When: Friday, June 2nd at 6:00 p.m. When: Friday, June 2nd at 5:00 p.m. When: Friday, June 2nd at 7:00 p.m. When: Friday, May 2nd at 7:00 p.m. Hear author Courtney Maum (known for her celebrated novel I Am Having So Much Fun Here without You and other works) read from her new novel, Touch, which focuses on a young woman with an incredible knack for forecasting future trends. When: Saturday, June 3rd at 8:30 a.m. When: Saturday, June 3rd at 10:00 a.m.
Come together with makers from around the region for interactive activities, demonstrations, and more. Expect the opportunity to solder, code, screen print, and create in other ways. This is a family-friendly event with plenty for all, including performances and more. See the website for more details. Tickets vary in price, running from $15 for adult presale to $20 same day, with a variety of discounts and bundles available. When: Saturday, June 3rd at 1:00 p.m. Educate yourself while enjoying some of the newest distillers in the Twin Cities area. This tour will take history and booze enthusiasts 21 years or older on a tour with stops at 11 Wells Distillery, the restored Commodore Bar & Restaurant, and Du Nord Cocktail room; samples are included in the ticket price. Tickets are $50, or $40 for members of the Minnesota Historical Society. You’ll be learning about Minnesota’s complex relationship with liquor. When: Saturday, June 3rd at 5:00 p.m.
Where: Adams Triangle, 4051 Minnehaha Ave. The Minne-Mile NightMarket is a community festival in the Longfellow neighborhood along the vintage shopping stretch of Minnehaha avenue. Come to this lively community event for family friendly activities, food, drink, and a variety of artists, makers, and vintage vendors. This event will be held outdoors, rain or shine. When: Saturday, June 3rd at 7:00 p.m.
United States Senator for Minnesota, Al Franken, will be at the Uptown Church for a conversation with MPR’s Gary Eichten to celebrate the release of Al Franken, Giant of the Senate. The book tells the story of a campaign that saw expectations defied and votes recounted. Tickets for this event are $28 and include a copy of the book. Senator Franken will be signing copies after the event. When: Saturday, June 3rd at 9:15 p.m. This free movie screening will be shown at Como Dockside and will be first-come first-serve for seating. The movie will be an old geek favorite, Back To The Future 2, featuring all kinds of space-time-continuum repair hi-jinks. The venue has seating for roughly 300 people, but capacity for around 700, so feel free to bring picnic blankets and chairs. When: Sunday, June 4th at 11:00 a.m. When: Sunday, June 4th at 12:00 p.m.